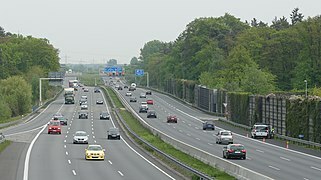 Sweden switched to RHT in 1967, having been LHT since from about 1734  despite having land borders with RHT countries, and approximately 90 percent of cars being left-hand drive (LHD) vehicles. A referendum was held in 1955, with an overwhelming majority voting against a change to RHT. Nevertheless, some years later the government ordered a conversion, which took place at 5 am on Sunday, 3 September 1967. The accident rate dropped sharply after the change,  but soon rose back to near its original level. 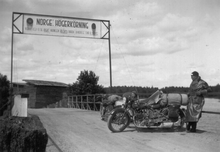 The day was known as Högertrafikomläggningen or Dagen H for short. When Iceland switched the following year, it was known as Hægri dagurinn or H-dagurinn. Most passenger cars in Iceland were already LHD. LHT was used in the Austro-Hungarian Empire, and when the empire was split up, the countries all changed eventually to RHT. Austria switched sides in 1921 in Vorarlberg, 1930 in North Tyrol, 1935 in Carinthia and East Tyrol, and in 1938 in the rest of the country. Partitions of Poland changed to RHT in the 1920s,  Partitions belonging to the German Empire and the Russian Empire were RHT. Croatia-Slavonia switched to RHT on joining the Kingdom of Yugoslavia, although Istria and Dalmatia were already RHT. 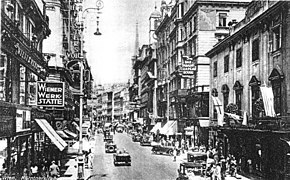 Nazi Germany introduced the switch to right-hand traffic in Czechoslovakia and Slovakia in 1938–39. West Ukraine was LHT, although the rest of Ukraine, having been part of the Russian Empire, already drove on the right. In Romania Transylvania, the Banat and Bukovina were LHT until 1919, while Wallachia and Moldavia were already RHT. In Italy the countryside was RHT while cities were LHT until 1927. Rome changed to RHT in 1924 and Milan in 1926. Alfa Romeo and Lancia did produce RHD cars until as late as 1950 and 1953 respectively only to special order, as many drivers favoured the RHD layout even in RHT as this offered the driver a clearer view of the edge of the road in mountainous regions at a time when many such roads lacked barriers or walls. The Rome Metro uses LHT. LHT was introduced in British West Africa. All of the countries formerly part of this colony have borders with former French RHT jurisdictions and have switched sides since decolonization. These include Ghana, The Gambia,  Sierra Leone, and Nigeria. LHT was introduced by the British in the East Africa Protectorate (now Kenya, Tanzania and Uganda), Rhodesia, and the Cape Colony (now Zambia, Zimbabwe and South Africa). All of these have remained LHT. Sudan, formerly part of Anglo-Egyptian Sudan switched to RHT in 1973, as it is surrounded by neighbouring RHT countries. In the late 1700s, traffic in the United States was RHT based on teamsters' use of large freight wagons pulled by several pairs of horses. 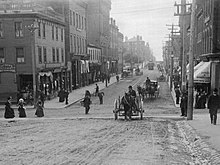 The wagons had no driver's seat, so the (typically right-handed) postilion held his whip in his right hand and thus sat on the left rear horse. Seated on the left, the driver preferred that other wagons pass him on the left so that he could be sure to keep clear of the wheels of oncoming wagons. The first keep-right law for driving in the United States was passed in 1792 and applied to the Philadelphia and Lancaster Turnpike. New York formalized RHT in 1804, New Jersey in 1813 and Massachusetts in 1821. Today the United States is RHT except the United States Virgin Islands,  which is LHT like many neighbouring islands. Brazil was a colony of Portugal and switched to RHT with Portugal in 1928. Other Central and South American countries that later switched from LHT to RHT include Argentina, Chile, Panama,  Paraguay,  and Uruguay. LHT was introduced by the Portuguese Empire in Portuguese Macau, Portuguese Timor. These are still LHT although Macau is now part of RHT China. East Timor Shares the island of Timor with LHT Indonesia. Was LHT as part of Portuguese Timor, then switched to RHT with Portugal in 1928. Under the Indonesian occupation of East Timor, changed back to LHT in 1976. In Japan, Post-World War II Okinawa was ruled by the United States Civil Administration of the Ryukyu Islands and was RHT. It was returned to Japan in 1972 but did not convert back to LHT until 1978. The conversion operation was known as 730 (Nana-San-Maru, which refers to the date of the changeover, 30 July). Okinawa is one of few places to have changed from RHT to LHT in the late 1900s. There are four road border crossing points between Hong Kong and Mainland China. In 2006, the daily average number of vehicle trips recorded at Lok Ma Chau was 31,100. The next largest is Man Kam To, where there is no changeover system and the border roads on the mainland side Wenjindu intersect as one-way streets with a main road. The Takutu River Bridge (which links LHT Guyana and RHT Brazil ) is the only border in the Americas where traffic changes sides. Most windshield wipers are designed to clear the driver's side better and have a longer blade on the driver's side  and wipe up from the passenger side to the driver's side. Thus on LHD configurations, they wipe up from right to left, viewed from inside the vehicle, and do the opposite on RHD vehicles. In most countries, rail traffic travels on the same side as road traffic. However, in many cases railways were built, often using LHT British technology, and road traffic switch the RHT while rail remained LHT. Examples include: Argentina, Belgium, Bolivia, Cambodia, Chile, Egypt, France, Iraq, Israel, Italy, Laos, Monaco, Myanmar, Nigeria, Peru, Portugal, Senegal, Slovenia, Sweden, Switzerland, Taiwan, Tunisia, Venezuela, and Yemen. 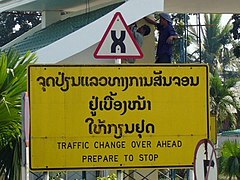 In countries such as Indonesia it is the reverse (RHT for rails and LHT for roads). France is mainly LHT for trains, except for the classic lines in Alsace-Lorraine  which belonged to Germany when the railways were built before 1918. Metros and light rail sides of operation vary, and might not match railways or roads in their country. Trams generally operate at the same side as a road traffic due to a common sections with roads. Algeria RHT  French Algeria until 1962. Andorra RHT  Landlocked between France and Spain. Antigua and Barbuda LHT  British colony until 1958. Caribbean island. Bahamas LHT  British colony before 1973. Caribbean island. Belize RHT 1961  Former British colony. Switched to same side as neighbours. Ghana RHT 1974 Ghana  when changing to RHT in 1974,  a Twi language slogan was "Nifa, Nifa Enan" or "Right, Right, Fourth". Ghana has also banned RHD vehicles. Ghana prohibited new registrations of RHD vehicles after 1 August 1974, three days before the traffic change. Indonesia LHT  Roads and railways were built by the Dutch, with LHT for roads to conform to Asian standards and RHT for railways. The Jakarta MRT and Palembang LRT also use RHT. Kenya LHT  Part of the British East Africa Protectorate before 1963. Philippines RHT 1946  Was LHT during the Spanish and American colonial periods. Switched to RHT during Battle of Manila in 1945. Philippine National Railways switched to RHT in 2010. 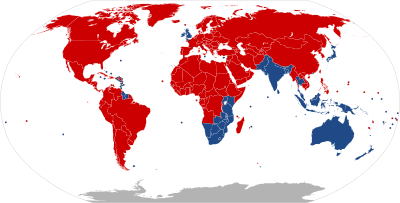 Portugal RHT  1928 Colonies Goa, Macau and Mozambique, which had land borders with LHT countries, did not switch and continue to drive on the left. The Porto Metro uses RHT. Russia RHT In the Russian Far East RHD vehicles are common due to the import of used cars from nearby Japan. Railway between Moscow and Ryazan, Sormovskaya line in Nizhny Novgorod Metro and Moskva River cable car use LHT. South Africa LHT   British colony before 1909. Thailand LHT  One of the few LHT countries not a former British colony. Shares long land border with RHT Laos and Cambodia. Trinidad and Tobago LHT  British colony before 1962. Caribbean island. Uruguay RHT 1945 Became LHT in 1918, but as in some other countries in South America, changed to RHT on 2 September 1945. 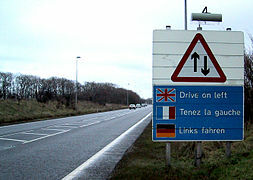 A speed limit of 30 km/h (19 mph) was observed until 30 September for safety. Yemen RHT 1977  South Yemen, formerly the British colony of Aden, changed to RHT in 1977. A series of postage stamps commemorating the event was issued. North Yemen was already RHT. ^ Bari, Dr Mahabubul (29 July 2014). "The study of the possibility of switching driving side in Rwanda". European Transport Research Review. 6 (4): 439–453. doi: 10.1007/s12544-014-0144-2. ^ Foerch, C; Steinmetz, H (2009). "Left-sided traffic directionality may be the safer "rule of the road" for ageing populations". Med Hypotheses. 73 (1): 20–3. doi: 10.1016/j.mehy.2009.01.044. PMID 19327893.